The world famous Eden Project was built in a disused clay mine and is home to an incredible global garden. A fabulous place to learn about nature and get inspiration from the world around us. Much more than just a greenhouse, The Eden Project has regular workshops and events for the whole family. It’s not just a summer venue either, the enchanted winter festival makes a great day for all the family, with ice-skating on offer and a visit to see Father Christmas and his elves! The National Seal Sanctuary at Gweek is a rehabilitation and release centre for seals, and is also home to a variety of other animals, including otters, sea-lions, penguins, sheep, ponies and goats. Take the nature trail and enjoy a great day out with the whole family. Flambards is the West Country’s leading attraction for rides, exhibitions and family entertainment. The incredible exhibitions include ‘Britain in the Blitz’ (a fabulous exhibition taking back in time to what life was like in the 40’s), ‘Victorian Village’, ‘Operation Sealion’, ‘Aviation Experience’, ‘War Gallery’ and ‘Hands on Science’. Children will also love the rides at ‘Ferdi’s Funland’ and ‘The Big Ride Zone’. Paradise Park is Cornwall’s top Wildlife Centre and is a great place to visit all year round. If you are lucky you could be selected to feed the penguins, otters, parrots or farm animals. Enjoy the well stocked gardens, and meet the many colourful and rare species of birds, plus there’s a soft play area & death slide in the Jungle Barn ! 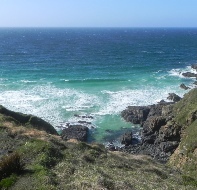 There really is so much to see and do in Cornwall, and not just in St Ives which is full of stunning beaches, amazing scenery and glorious cream teas! There is so much to see and learn in the West Country. St Ives itself has an incredible quality of light and is an area of undeniable natural beauty, providing inspiration to artists, poets, writers, sculptors and ceramicists to name but a few. 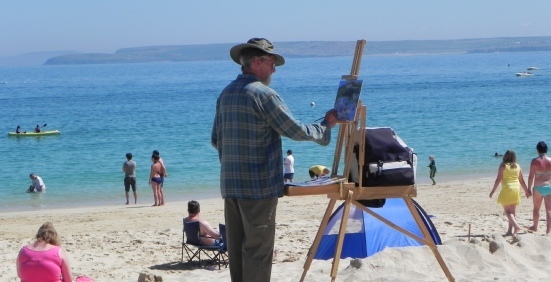 There is a huge variety of galleries and studios to visit in St Ives, many of which are dotted between the quaint fishermen’s cottages, as well as world famous venues that attract visitors all year round …. St Ives is renowned as an artistic and cultural hub and it literally comes alive in September with the St Ives September Festival - one of Cornwall’s richest cultural experiences delivering a full spectrum of arts from classical to world music, folk and jazz to flamenco, pottery to theatre, talks, exhibitions and more ..… Foodies will love the St Ives Food & Drinks Festival which takes place in May. Last year the chef line up included Jack Stein. 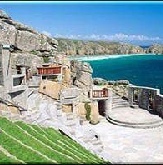 The Minack Theatre at Porthcurno is Cornwall’s world famous open air amphitheatre, where the seats have been carved into the granite cliffs, nearby is Porthcurno’s Telegraph Museum which holds a special place in history as the most strategically important communications site in mainland Britain. Back in St Ives the award winning youth theatre Kidz R Us has plenty of shows and workshops, and the St Ives School of Paining runs courses throughout the year. Cornwall is home to plenty of exotic gardens, including Trebah with its stunning coastal backdrop, tin mines, including Geevor and Poldark both mines have a story to tell, and plenty of National Trust venues, such as St Michael’s Mount - depending on the tide you can either walk to it across the causeway or catch a boat taxi! World famous venues in St Ives include Tate St Ives, part of the Tate family of venues that hold the national collection of British art from 1500 to present day, and international modern and contemporary art, and The Barbara Hepworth Museum and Sculpture Garden which gives a remarkable insight into the work of one of Britain’s most important 20th Century artists, but there are also over 70 museums in Cornwall to visit, including the lesser known St Ives Museum. 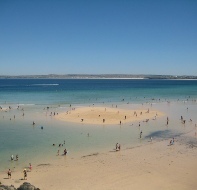 There are a number of golden sandy beaches that make up the magnificent stretch of coastline known as St Ives Bay, including Bamaluz Beach, Carbis Bay Beach, Godrevy Towans, Gwithian Towans, Hayle Towans, Lambeth Walk, Porth Kidney Sands, Porthgwidden Beach, Porthmeor Beach, Porthminster Beach and Upton Towans. Carbis Bay Beach :: Sea Shells is just a five minute walk to the magnificent Carbis Bay beach, with its stretch of golden sands and an ocean of sparkling turquoise sea - the views are simply breathtaking. 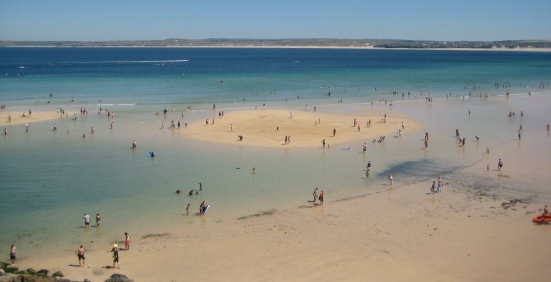 A good, safe family holiday beach with lifeguard cover from May to September. There are plenty of water sports on offer at this beach from Ocean Sports and facilities include toilets, a shop, cafe, takeaway and beach restaurant - why not pack a picnic in the bag we’ve provided and stay all day! Porthgwidden Beach :: is popular with families as it is very sheltered and a bit of a sun trap. Known locally as ‘the Island Beach’, Porthgwidden Beach is east facing with lovely soft sand. ‘The Island’ is a paradise for bird watchers as it is a stopping off point for migrating birds. Seals, dolphins and porpoises can often be seen here. 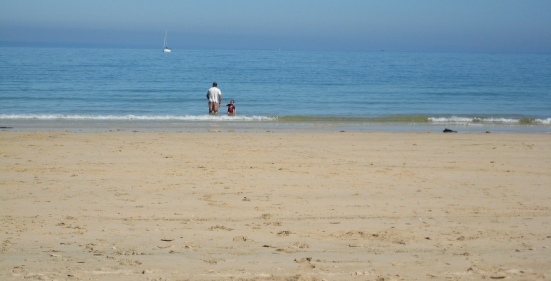 Porthminster Beach :: just a ten minute walk from Sandcastles. This very popular family beach is a large, sheltered beach with impressive views across St Ives Bay to Godrevy Lighthouse and has excellent facilities. The back drop of palm trees and sub tropical shrubs help provide a Mediterranean atmosphere. Located immediately below St Ives Railway station this beach is just a two minute, very scenic, train ride from Carbis Bay. The coastal path that leads from here to Carbis Bay is a delight! 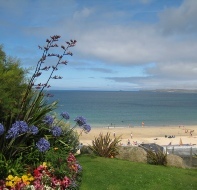 Porthmeor Beach :: another fantastic beach in St Ives, popular with families and surfers alike. Water sports are the order of the day at this almost tropical flavoured location, but you can easily just lie back on the crisp, golden sands and soak up the atmosphere. Superb beach facilities, including a surf school during the summer. 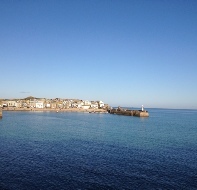 St Ives is renowned for its quality of food and innovation and has an abundance of places to eat and drink. Whether you’re looking for breakfasts, a traditional Cornish cream tea or a fine dining experience …then look no further. Choose from world class winning restaurants to supreme takeaways; many of the eateries source their food locally using the finest fresh Cornish products wherever possible. 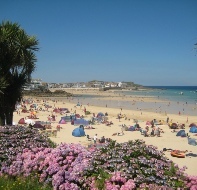 St Ives is literally packed with great eateries, families will love the award winning burger bar, Blas Burgerworks which has earned its place in the Good Food Guide, the Harbour Fish & Chips, with amazing views of the seafront, and the Cafe Pasta with its relaxed and friendly atmosphere (and views of the Harbour!). No holiday to St Ives would be complete without a trip to Moodmaids of Zennor ice cream parlour, with a great choice of locally made ice-creams and sorbets. St Ives has a great choice of beach restaurants, all with the most stunning views - window seats definitely recommended, and includes the famous Porthminster Beach Cafe, Porthmeor Beach cafe, and Porthgwidden Beach cafe. Carbis Bay also has its own Beach Club Restaurant , again, with stunning scenery! A short drive away, there are a great choice of world class eateries, including Jamie Oliver’s Fifteen at Watergate Bay, Rick Stein’s Seafood Restaurant at Padstow (Rick Stein also has outlets at Falmouth, Porthlevem and Newquay! ), Ben’s Cornish Kitchen at Marazion and Nathan Outlaw’s Restaurant and Fish Kitchen at Port Isaac. There is no questioning the quality of light and air in this part of West Cornwall that makes being outside so fantastic, and if you fancy more of a challenge that just blundering around the art galleries before tucking into afternoon tea, then look no further! This part of West Cornwall has it all ….. SUP boarding, kayaking, surfing, body-boarding, golfing,walking, fishing,cycling, horse-riding …… and so much more ……. 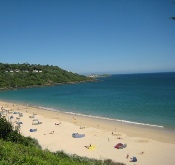 Ocean Sports are based at the incredible Carbis Bay beach, with its soft white sands and sparkling azure waters, and offers a wide range of water and beached based activities suitable for all ages and abilities. Book a lesson and learn to SUP (stand up paddle board), or just hire a board and try it out for yourself. There are single and double kayaks (single hire costs from just £7.50 per hour) and there’s an amazing Hawaiin Outrigger as well as a beach club for children during the summer holidays. St Ives Surf School operate from Porthmeor Beach in St Ives and offer surf lessons as well board and equipment hire, including SUP boards and kayaks. They also cater for those adrenaline junkies brave enough to try coasteeering. Nearby, Gwithian Academy of Surf also offer great surfing experience - lessons or hire. There’s an outdoor Go-Karting track just a few miles away at St Erth, where juniors (aged 8-12) can race against adults (aged 12-99) to see who is the best! Coast to Coast Karting. Or why not cycle along the Coast to Coast path that runs from the South Coast at Devoran to the North Coast at Portreath, taking in the site of the old mine workings along the way. Bike hire available from Bissoe Bike Hire. And there are lots of great walks along the South West Coastal path to suit all fitness levels. The St Ives Bay branch line is arguably one of the most scenic railways in the UK boasting incredible sea views. It’s just a two minute journey from Carbis Bay to St Ives, and the branch line connects to Paddington via the main line at St Erth, so a car for your holiday is nice, but not essential! Real Ale fans might want to give the ‘Rail Ale Trail’ a go - what a great way to try out the pubs between Penzance and St Ives and to sample the local craft beers. Train Timetable. You can easily explore West Cornwall by using the local bus network, First Kernow. The open top bus that runs from St Ives to Lands End is a real delight - with jaw dropping scenery. Day trips to venues such as the Minack Theatre, Eden Project and the Lost Gardens of Heligan are all available from Oates Travel in St Ives. You can fly to Cornwall on direct services from around the UK, Ireland, Germany and Spain, and on indirect services from around the world to Newquay Airport. Car hire is available at the airport for the last leg of your journey. For a special day out, why not book a day trip to the Scilly Isles? Flights leave from Lands End Airport and take about twenty minutes. The Scilly Isles almost take you back in time and the experience is really something very special!